Yeah – “wrong” is a strong word and it’s bound to cause some grief. But I’ve been designing layouts for myself and others for about 40 years, and based on that experience I would argue that most people in the hobby think about the wrong things when they think about the term “minimum”. The person who started the discussion was trying to figure out how to get away with using a smaller minimum radius or a smaller minimum turnout size for their layout. Presumably, the people who started these discussions want to maximize the fun factor of their layout by maximizing the amount of layout they can fit into their train room. The theory is that the more track one packs into the space, the more fun the layout will be. What’s the minimum amount of trackage I really need to create a satisfying layout? Real railways maximize curve radius and turnout sizes. Broader curves and larger turnouts translate into higher track speed and less wheel wear. At the same time, real railways minimize the amount of track they build, paring it down to the essentials – because track costs money to build and maintain. A real railway will never use two turnouts where one will suffice. Those who are interested in building train sets will continue to focus on minimum track standards, to pack the most track into their available space. But what they’ll end up with is a train set. Even the largest layouts will look like a train set if the curves are too tight and the available real estate is packed to the edges with ties and rail. 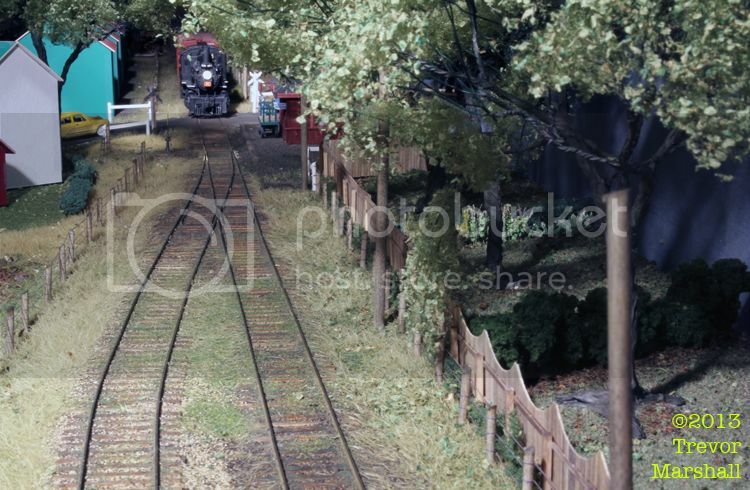 At the other end of the spectrum, those who are interested in replicating a real railway in miniature would do well to pay more attention to maximizing their track standards – and minimizing the amount of track they plan to build in their layout space. Nobody ever tore down a layout because the curve radius was too large, or the turnouts were too big. But lots of layouts have ended up in the bin because curves and turnouts were too small. Nice one. Must admit that whilst I can understand why some are drawn to the “multum in parvo” potential of micro layouts, the only ones which work for me are generally low on the track count, and high on the cameo-style presentation – and operationally less intensive. …And to accept that running large engines on tight curves is the provenance of train sets, of course. If memory serves, I have admitted elsewhere on this blog that 42″r works for me from a technical perspective – in other words, the stuff goes around it – but it fails visually every time I run a full-length (90-foot) passenger car. Fortunately my curved track – including the longest curves – will be mostly hidden in thick forest so I won’t have to look at it. Walthers Shinohara turnouts come in a #10 (in HO at least), and do look more prototypical than the very short turnouts usually seen. Well, colour me “corrected”. Thanks Andrew. I hope more people use them – especially when planning smaller layouts. Planning for larger standards – Number 10 turnouts and generous curves – will force a person to edit one’s track requirements. And editing one’s track requirements not only puts the focus on the track that’s really important – but also makes for a more achievable layout. If you are interested, I have a 1930s CNR MOW manual that has (among other things) scale diagrams of turnouts up to #20. I’d be happy to send photocopies. Thanks Andrew. Sounds like a neat document. I’m good though – as I noted in my post, I encourage people to use the largest turnouts and radii they can. For me, that’s a Number 10 turnout – I can’t see myself having the space for larger. I initially thought of using Number 6 turnouts for my modest branch line layout. I’m glad I went larger – much larger. They did not require me to sacrifice too much space. Because I didn’t try crowd my layout with track, I had room for larger turnouts. We often think in terms of “knowing” your prototype but I wonder if it’s more a case of understanding why you’re attracted to it. Understanding that attraction goes a long way too when developing fictional railways too. Perhaps it’s these subconcious details that delineate between succesful model scenes and the rest? I think we build model railways out of a need to share what thrills us with others in a way beyond simply describing it. At the risk of waxing too philosophically, these models are our means of telling that story. Every time I’ve sat down with vintage maps and drawings of the Prince Edward Island Railway I’m always so captivated by how efficient typical stations and yard designs were. There were never complicated yards or any unnecessary track. You could tell that turnout parts were costly and would use money that just didn’t exist. The railroad made do and did so because it understood how to get the most out of its means. It speaks to a frugality that can be a real challenge to design into a model railway but so rewarding when it’s done right. Not how much but how well you used it. 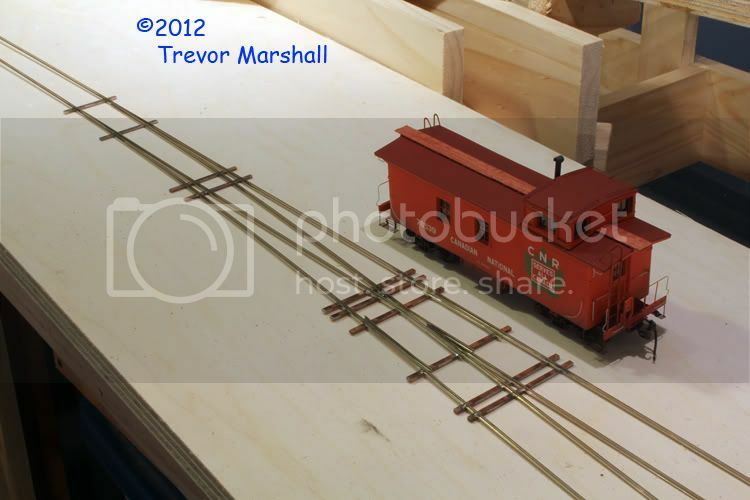 I am primarily a 1/4″ scale narrow gauge modeler but have always liked SG short lines as they often “feel” like NG. Every layout I have built has been a compromise because of space but that has not kept me from having easements and super elevation on the curves and following prototype practices in designing station and industrial scenes. Because of retirement funding and space limitations, the new layout room will require just as many compromises as others have but the track plan will be minimalist. If it is On3 it will be #6 or #8 stubs and 36″ curves. If “Maine On30″ #5 turnouts and 28″ or 30” curves. But the rail will be Code 83 and 70 in either case. I think these discussions are indicative of real change going on in the model railroad hobby. The fact that they have gone on for a long time in the UK fine scale community doesn’t mean they shouldn’t be going on in North America, but it has taken a heck of a long time, hasn’t it? The North American desire to model all the operations of a prototype — or at least to fill an entire large room with multiple levels of track — is increasingly being questioned. Every iteration of my own model railroad, both on paper and in wood and plaster, over the past decade has gotten simpler. I think it is still too complicated. As I work on the main layout, I am conducting a series of experiments to create achievable layouts to meet some special circumstances of my own: like many retired people, I divide my time among several places. * How do I create layouts to store in my alternative places of residence that will be satisfying to build, reasonably attractive to look at, and interesting to operate? It turns out not to be a trivial task. Your discussions and Lance Mindheim’s, David Barrow’s and Keith Jordan’s practice, Reilly Triggs’ design thinking are all important to me. *In Canadian terms, I moved to the cottage after retirement but divide my time among there and tiny apartments in Boston and in the city where my grandchildren live. Very good points – and not just for retirees of course! I live in a big city and the housing growth is powered by condos. We had municipal elections in 2006 and 2010. In those four years, the downtown ward in which I live grew by more than 30,000 households – more than 100,000 people – almost all of it condos. Young people are choosing to live downtown to be close to work and fun. While the housing boom is remarkable in Toronto, I’m sure younger people are moving downtown in all large, vibrant North American cities. The conventional model of “big basement with massive layout” is not only impractical for most – it’s also out of reach. Fortunately, modellers are learning to observe the prototype and sharing what they learn – and the big lesson is that it doesn’t take 100 turnouts to offer guests a rewarding operating session. The prototype does more with less: we can too. The “right” way I suggest is to think minimalism in designing a layout and I’ve found that copying a prototype is the easiest way to avoid a toy layout. This is the approach I took in replicating the diamond crossing at Doswell VA.
Building an achievable and manageable layout shouldn’t be a new idea. Over the decades, we have been indoctrinated into the Church of Selective Compression, haven’t we? It’s only been in the last few years that other ideas have been published that reflect a more focused effort on a smaller segment of the prototype. The hobby will shift slowly as people come to realize how much you can do with just a mile, or less, of railroad. I’ve recently begun to realize how common an industrial branch once was in many US cities of large and small sizes. Lance Mindheim has illustrated the possibilities of modern railroading with the Miami operations. Keith Jordan has shown us the wonder of The Patch in Los Angeles. These type of rail service lines lurked through the heart of many places dating back to the 19th Century. I know of a few great examples in Pittsburgh, Cleveland, and even in my new home of El Paso, TX. These industrial segments will slowly come to be known to many in the hobby. Many of these rail lines feature two or more railroads and a diverse array of industry. A couple of them trundle past empty undeveloped lots and forested segments that belie their proximity to a major population center. Many have long disappeared from the urban scene. But it will take time and several published examples for many modelers to embrace the opportunities that may have once operated just a few blocks away from their new urban digs. Thanks for joining the conversation – and you make some great points. You’re right – more features in the mainstream press will help people embrace achievable layouts. It seems there’s a huge gap between the so-called “lifetime layouts” – multideck, multi-operator monsters – and the beginner layouts designed to introduce people to the hobby. I thin better designs for beginning layouts would help – for example, layouts based on prototypes such as the ones you mention, rather than those based on what fits on a 4×8. Presenting the hobby as “challenging and rewarding” rather than “easy” would help foster a mindset of quality over quantity, too. There’s a lot more to say on this subject – and those blogging about their own achievable layouts are helping to spread the message.